ANTRIM’S promotion prospects are on the line when they host Westmeath in Corrigan Park on Sunday. At the mid-way stage of the League campaign, Antrim will put themselves in a strong position to qualify for the Division 2A final with a win on Sunday. Defeat would almost certainly end their hopes of promotion. The Saffrons suffered a two-point defeat to Kerry in their League opener in Corrigan Park before bouncing back to record a dramatic one-point win over Meath in Trim earlier this month. James McNaughton scored the winning point deep into injury-time, moments after Meath had drawn the game via a goal from a 21-yard free from Jack Regan. Captain, Conor McCann knows how valuable that victory was as Antrim chase a swift return to Division 1B following their relegation last spring. “We are obviously very happy with the result and it was a good performance,” said McCann. “Conditions were difficult and Meath are a really good side in fairness to them. They are very tough to play against, especially in Trim. “It gives us a more positive lead-up to the Westmeath game. The division is very tight. Every game is going to come down to the wire, but we are looking forward to playing Westmeath at home. Sunday’s game against Division 2A pacesetters, Westmeath could see the return of several established stars who’ve been previously unavailable for selection. Last weekend, both the footballers of Naomh Éanna and the hurlers of Cushendall were in All-Ireland Club action in Dublin. Naomh Éanna suffered a 13-point defeat to Kilcummin in the All-Ireland Club IFC final at Croke Park, while Cushendall lost out to St Thomas’ of Galway a few miles away in Parnell Park. Antrim were without Simon McCrory (injured) and Nicky McKeague (suspended) for the trip to Meath, but both should be available for selection on Sunday. Manager, Neal Peden stressed that he won’t rush any players back following a prolonged club campaign. However, McCann, who won an All-Ireland Club Junior hurling title with Creggan Kickhams back in 2014, hopes their return will provide a huge boost to the morale of the squad. “We will look forward to having Joe Maskey (Naomh Éanna) back. He has been around the panel lately, so he knows the score,” said McCann. “It will be good to get him back on the pitch. It is great to experience that with your club and the build-up to it is unreal. With so many established players absent in recent weeks, Peden has given plenty of fringe players the chance to impress in the opening two rounds. However, Loughgiel’s James McNaughton has been the stand-out performer against both Kerry and Meath. Having gained valuable experience and game-time last season, McNaughton has started the 2019 season in great style – scoring 0-12 against the Kingdom and following it up with 1-8 against Meath. Dunloy youngsters Ronan and Keelan Molloy and Eoin O’Neill also performed well against the Royals and McCann believes the unforgiving nature of an competitive Division 2A is the perfect place for the prospects to find their feet at senior level. “It is good for those young lads to get in and experience it. It is tough to come down to places like Trim and hopefully it will stand to them,” added the Antrim skipper. “The young lads are very good and there are maybe five or six more senior boys in the panel. We are trying to help them along. Antrim and Westmeath have had many battles down through the years – most recently in the Kehoe Cup final at Abbotstown. The Midlanders won in a penalty shoot-out and they also emerged victorious when the sides met in an epic Joe McDonagh Cup game in Cusack Park last summer. 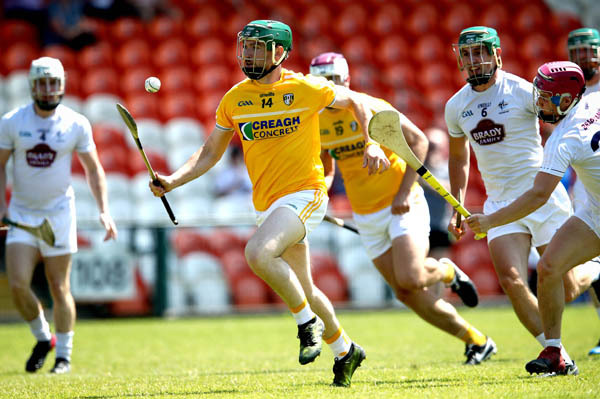 That 2-19 to 1-20 loss all but ended Antrim’s hopes of reaching the Joe McDonagh final and the subsequent defeat to Kerry saw them needing to defeat Kildare in a relegation play-off. Sunday’s rematch with Westmeath will have similar implications for Antrim’s League ambitions.